I'm making steady progress on the wedding suit. It's been awhile since I've done any tailoring, so the amount of basting and handsewing has been a little overwhelming at times. I'm using the Roberto Cabrera book on tailoring which is usually helpful, but tonight he has me totally baffled about constructing the collar. It's almost more confusing than putting in a zipper fly! So I'm just going to walk away for the night and pick it up in the morning when I'm fresh. I do that a lot, hence I'm one of the slowest sewers out there. The sleeves are essentially done, they just need buttonholes on the vents. I do like Cabrera's method of making and lining the sleeves. 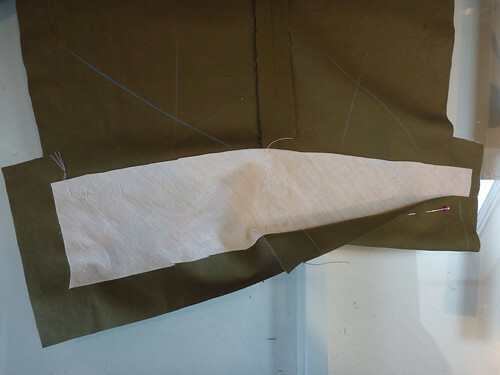 You do have to make a muslin first because the length will be set when all is said and done. 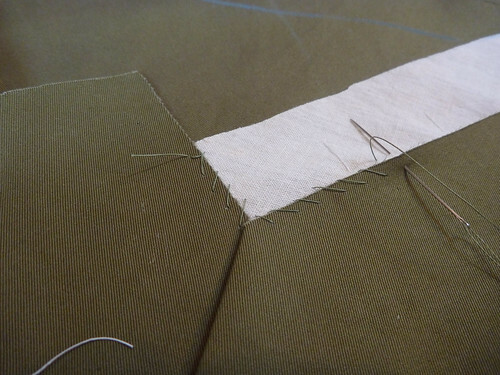 A wide piece of bias muslin is basted into the cuff along the hemline and fold lines of the vent. 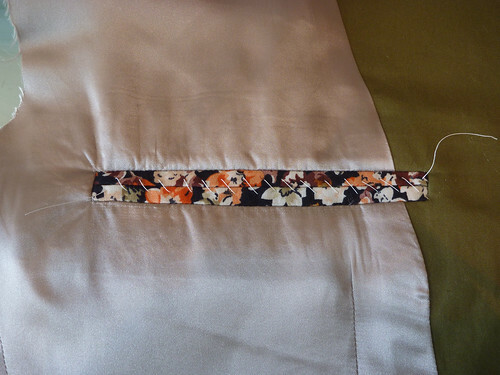 The hem is pressed up and attached to the muslin. This way there will be no stitches visible on the outside of the cuff. The sleeve and lining are then sewn up as usual. Both the sleeve and the lining will be wrong side out. 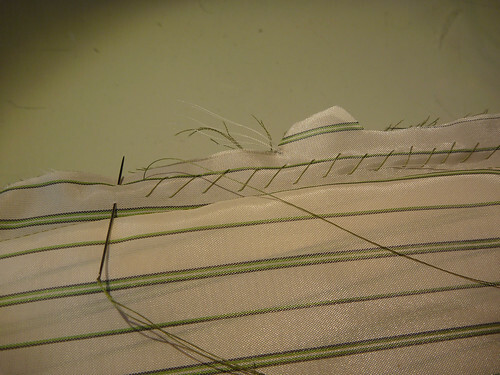 They're stacked up and the corresponding seam allowances are quickly stitched together with a diagonal stitch. Nothing fancy here. Then the fun happens. 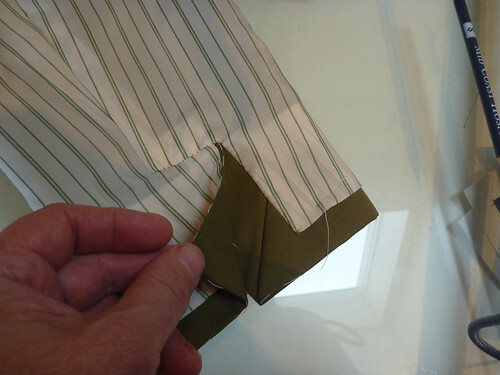 Reach down through the lining and pull the sleeve up through it. Voila! A perfectly lined sleeve (inside out) ready to have the lining finished at the vent. Here's the finished vent. You just have to fiddle with it until it works. 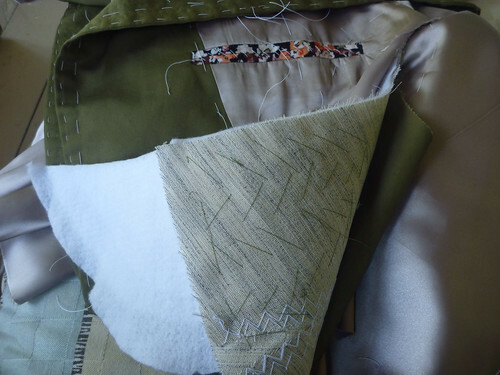 Once it makes sense and comes together, I press it into position, baste to hold things together and then slipstitch with silk thread. The sleeves are done for now and set aside. 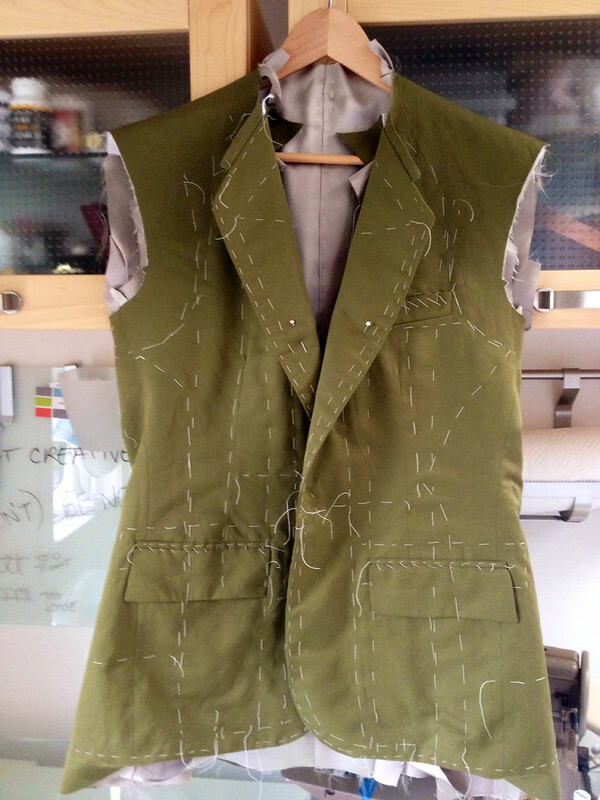 Next I've worked on the lining and added an inside left chest pocket. I used some of my left over shirting fabric for the welts. A fanciful touch. 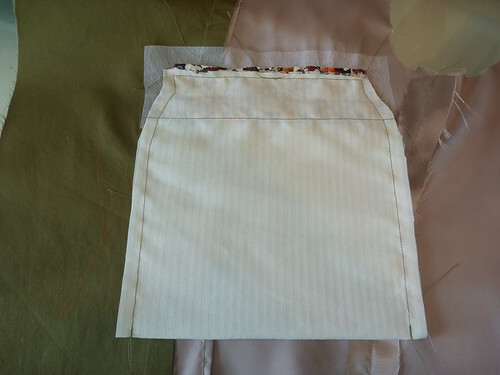 This is the same pocket construction as the outside pockets, just a bit smaller. 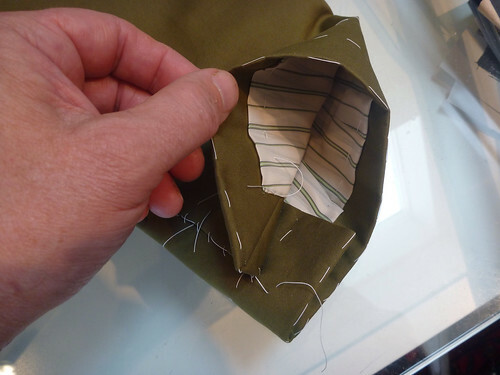 I'm not bothering to make a right inside pocket because I would never use it, not to mention the time required to make it. It looks like this from the inside. I've put in the shoulder pads. The front of the pad is padstitched into the canvas. It's kind of a wrestling match, and I'm always glad when this step is over. It's not pretty, but it works. It's looking amazing - I love looking at all your construction photos. The hint of that lovely matching floral on the hidden pocket is my favourite. Basting is something I enjoy sewing in, but get so frustrated at taking out! Back from a break. Soldier on, Dad.